Easily add files to your Zimbra account … and export too. Have address books/contacts in multiple accounts? You can export that data (from Google, Yahoo!, etc.) and import it into Zimbra – keep all of your info in one place! Likewise, you can export from Zimbra to keep backups and more. To import, choose a file and click Import. 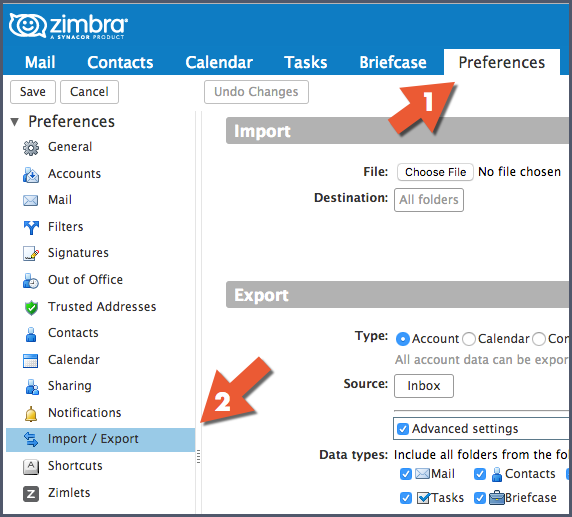 Zimbra automatically detects the type of file being imported and displays appropriate import options. Select the type of item: Account (mail folder), Calendar or Contacts. Select the item from the Source menu. Here is a demo of importing and exporting in action.